When traveling in Southern California and the area of San Diego, especially for your most important parties and celebrations, the essential choice has got to be San Diego Limousine. We've built up a solid reputation over the years, and our loyal customers will be more than happy to tell you that our buses are the best in the state. Believe us when we say you are in for a treat when you travel with San Diego Limo Buses. And the fact that you will be traveling in the San Diego area makes everything that much sweeter because there are few places in the world that are more pleasant or have more things to see and do than San Diego. You certainly are not going to want to miss amazing destinations like the Botanical Building in Balboa Park, the Torrey Pines State Reserve, the San Diego Zoo and the USS Midway Museum just to name a few. But it is important to know that visiting these great places is most enjoyable when you are riding with us. If a major event is coming up on your party radar, such as a bachelor or bachelorette party, a wedding, a San Diego sporting event, or even a night of club hopping at all the wildest destinations that Southern California serves up, our goal is to have San Diego Party Bus pop up first in your mind as the #1 choice for an incredible ride and the safest and most affordable trip too. 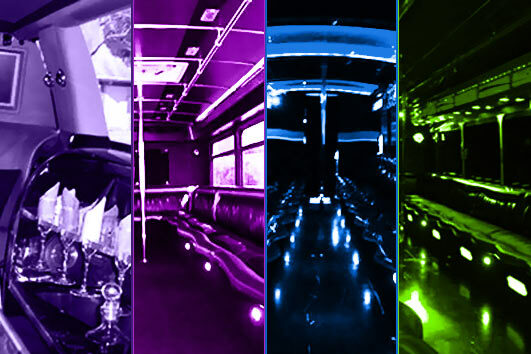 Party Bus San Diego is the one to trust. There are many reasons for this. We put our customers first because we realize that you are the reason we are in business. Without you there is no us. So, with that mind, it is our passion to make sure each and every customer that rides with us is completely satisfied. There's no reason to settle for a cramped San diego limousine or, even worse, your own fleet of cars trying to follow each other on the freeway, getting lost and running out of gas at the most inopportune times, and requiring multiple fill-ups when gas prices are at their most expensive in history. You have been there, and you don't want to do it again. Many people think that they can use the old method of carpooling. But we urge you to think again. Think about it, your group will be divided right from the start. You also will have to designate drivers which means that a few in your group will not be able to enjoy their favorite libations. Each of your vehicles will have to fight traffic and then search for decent parking spaces at each location and then come together again and again. This doesn't sound like a lot of fun to us. You can do better right now by choosing our company, and you can lock down a San Diego Party Bus price right now, totally free with no obligation. Contact info is at the top of every page of the site, so get in touch when you're ready! We hope you'll enjoy browsing through all of the content that we've put together for you, including important background information on our company, detailed information about our incredible fleet of limo bus vehicles, and even some information about our super conscientious professional chauffeurs who are really the backbone of our business. Of course there are plenty of picture of our party buses so you can get a feel for what you'll be enjoying when on the road with us. We suggest that you have a notepad and pen next to you as you peruse our site in case any questions or concerns may come up. If you've got any questions for us that we haven't answered here, you know where to reach us. Our friendly and knowledgeable customer service agents know our business very well and they will be able to not only answer your questions, but also walk you through the easy and painless booking process. We look forward to making that connection and making your trip amazing. Super flashy interiors that make an even bigger impression on your friends! You may be wondering why our company is the best in the luxury entertainment transportation industry. There are actually several reasons why. First and foremost, we realize without the highest quality vehicles we would not be much good to anyone. So, we only acquire top notch vehicles and then we take those and install the most amazing features and amenities for the highest level of fun and excitement. Safety is another major priority for us. We have certified mechanics on staff who regularly inspect and maintain our entire fleet. What this means for our customers is that our vehicles are always road worthy and ready to take you where you need to go. We also hire professional detailers who meticulously clean every inch of the interiors between uses. In fact, they do such a great job that you are going to wonder whether you are stepping into a brand new vehicle or not. Of course we have to mention our fabulous drivers. We only hire certified and experienced drivers who know the area roads very well and who are trained in the highest form of customer service. But there is yet another team member you need to know about. Our affable and knowledgeable customer service agents know our business well and they are very passionate about making sure that all of our customers are completely satisfied. And now you know why we are the best. View our Massive Service Area! We service the entire area and continue to expand constantly.